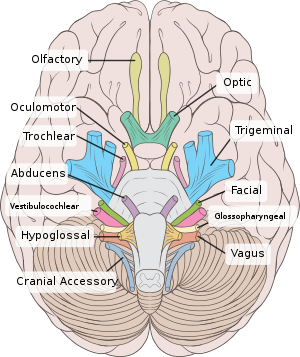 Schematic illustration of the trigeminal nerve and the organs or structures it supplies. Blumenfeld H. Neuroanatomy Through Clinical Cases. Sinauer Associates, Inc. 2002. Brodal P. The Central Nervous System. Oxford University Press, 2004. Carpenter MB, Sutin J. Human Neuroanatomy, 8th ed. Williams & Wilkins, 1983. DeJong, RN. The Neurologic Examination, 3rd ed. Hoeber, 1970. Ropper, AH, Brown RH. Adam’s and Victor’s Principles of Neurology, 8th ed. McGraw-Hill, 2001. 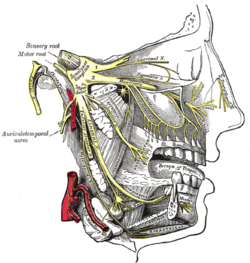 Wilson-Pauwels, L, Akesson, EJ, Stewart, PA. Cranial Nerves: Anatomy and Clinical Comments. B. C. Decker Inc., 1998.